....................... 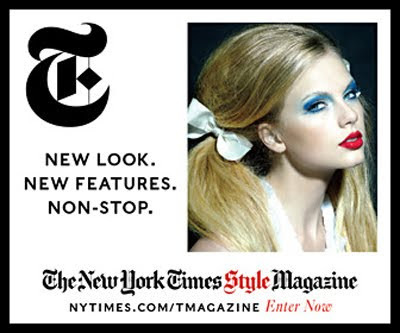 It may be that I'm turning into a stodgy ol' fart but, this is the cover of the Style magazine section of Sunday's NY Times and that lady on the cover looks like some alien type queen bug whose fingernails are perpetually NOT dry. Tre' Bride of Frankensteinish. So thats glamor, huh? Woo Hoo x2! !